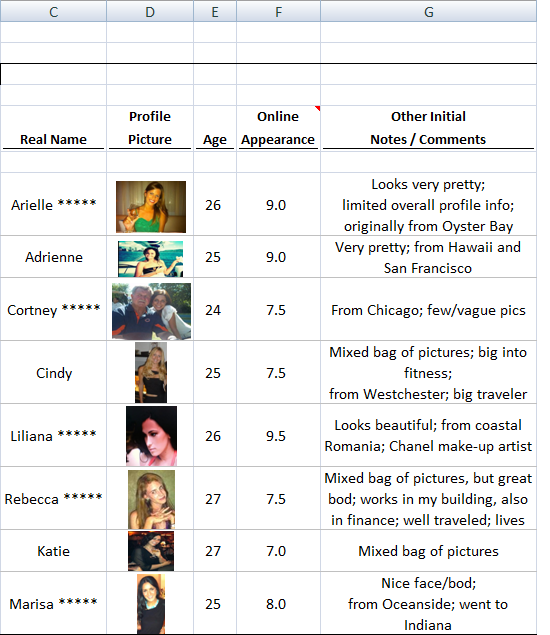 A New York financial services employee, known only as "Dave", decided to organise his online dating prospects in the way he knew best - he created an Excel spreadsheet to track the progress from his first impressions based on their dating profile, through to the outcome of any actual dates. Unfortunately for Dave, he forwarded his work to Arielle, another Excel geek, and one of the prospects in his spreadsheet. Which is how details of Dave's complicated love life came to be poured over by bloggers and bored office workers throughout the world. Dave used his spreadsheet skills to include time-saving features, such as drop-down lists for quickly selecting age and appearance. 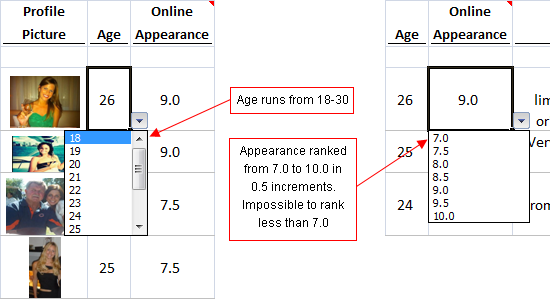 Whilst he didn't go as far as embedded formulae, linked graphs or pivot tables, he did add annotations to each column heading with a more detailed explanation of the data within. The spreadsheet reveals intriguing details of prospects including Cortney from Chicago (7.5, stood Dave up, "at hospital with friend"), Rebecca from Lower East Side (7.5, cancelled, "work related") and Marisa from Oceanside (8.0, "nice bod... very jappy"). "I work with spreadsheets a lot," he told them. "It's a great additional tool. I work long days, go to the gym, go out on a couple of midweek dates or what not, get home late...how am I going to remember them? I'm not. So I made the spreadsheets. My comments aren't malicious or mean. This was an honest attempt to stay organized." When asked why he sent Arielle the spreadsheet, Dave said: "she works with spreadsheets a lot too."